The main thing I love about fashion, is personal style. That is what drew me to wanting to pursue a career in this field, creating a blog, and starting a YouTube channel. Style is so important. As the quote above states, fashions will come and go, but your personal style is yours, and yours forever. 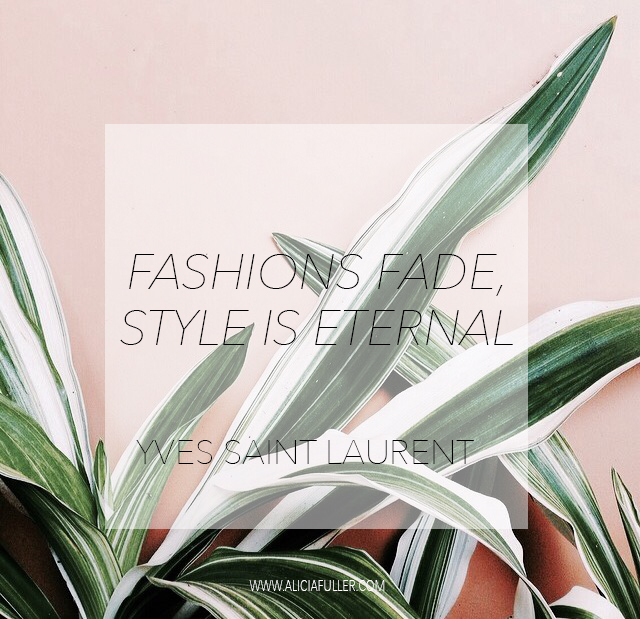 Sure, the theme of your wardrobe may change, and your style may evolve, but it is always going to be your style. Your style is the difference between you, and someone else. It is an extension of your identity, and can boost your self confidence. Once you begin dressing the way you want to dress, and now how others think you should, then you come into your own and gain a newfound confidence about yourself. Personal style is a very powerful thing! Fashion definition: a widely popular expression. Style definition: a distinctive manner of expression. Fashion is something that everyone follows, like a trend. But that doesn't mean that it's something that you have to like and embrace. To put this into perspective, I'll share a fashion trend that I personally cannot stand. Jelly sandals. I hate jelly sandals. Those died for me after 2002, sorry. There are just some fashion trends that not everyone cares to wear, and they don't fit in with my aesthetic, my taste, or my personal style. Anyhow, to tie chapter one together, style is important. Style is what make you an individual. Style makes you, you. Stay tuned for chapter two.